Space Shuttle Atlantis Was A Space Launch Vehicle. Space Shuttle Atlantis was the fourth space shuttle constructed by NASA. Space shuttle Atlantis is one of the fleet of space shuttles belonging to the U.S. Space shuttle Atlantis was the fourth operational space shuttle built. 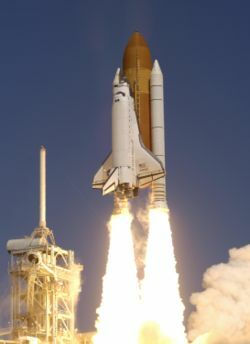 Following the destruction of Space shuttle Challenger and Space shuttle Columbia, Space shuttle Atlantis is one of the three fully operational shuttles remaining in the fleet. The other two are Space shuttle Discovery and Space shuttle Endeavour. After Space shuttle Atlantis completes STS-125, the final Hubble Space Telescope service mission, Atlantis is scheduled to be the first space shuttle retired from the fleet. A petition is circulating to convince NASA to retire the Space shuttle Atlantis at its birthplace at Palmdale Airport's Plant 42 in Heritage Airpark. Operational history of space shuttle Atlantis. Atlantis docked with Mir space station. Atlantis before the launch of STS-115, August 29, 2006. Atlantis made its first flight in October 1985, conducting classified military activities, one of five such flights. In 1989, Atlantis deployed two planetary probes, Magellan and Galileo, and in 1991, it deployed the Compton Gamma Ray Observatory. 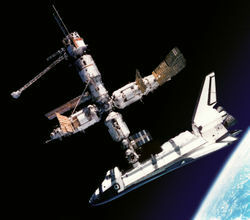 Beginning in 1995, Atlantis made seven straight flights to the Russian Space station Mir. On the second Mir flight, it delivered a docking module, and on the subsequent flights, it conducted Astronaut exchanges. From November 1997 to July 1999, Atlantis underwent refitting operations, with about 165 modifications made to the shuttle, including the installation of the Multifunction Electronic Display System, or glass cockpit. It has made six flights since then, all involving assembly activities at the International Space Station. In October 2002, Atlantis and the six-person crew completed an 11-day mission to the International Space Station that involved three space walks. NASA scheduled the 27th launch for Atlantis for September 2005, during the window of September 9 - 24. 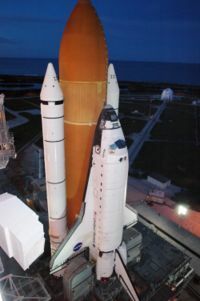 It was ruled unsafe to fly the mission and the launch window was missed, due to the complications during Discovery's launch of mission STS-114 and NASA's subsequent suspension of all future shuttle launches. Atlantis was the designated STS-300 rescue orbiter for the STS-114 mission. Atlantis was scheduled to fly the STS-121 mission, but it was decided that Discovery would fly the mission instead. After a four-year-halt she went back in orbit along with six astronauts on STS-115, carrying the P3/P4 truss segments and solar arrays. 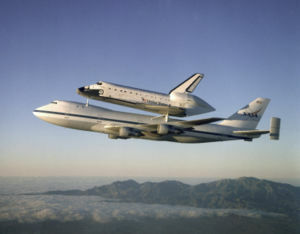 Atlantis is scheduled to be retired in 2008 after its last scheduled flight, STS-125, the final servicing mission to the Hubble Space Telescope. It would be used to supply parts for Discovery and Endeavour through the anticipated end of the Space Shuttle program in 2010. Atlantis was chosen for early decommissioning to avoid a costly overhaul process that was slated to begin in 2008. Flights of the space shuttle Atlantis. Space Shuttle Atlantis has completed 27 flights, spent 220.40-days in space, completed 3,468 orbits, and flown 89,908,732 miles in total, as of September 2006. 1985 October 3 STS-51-J First Atlantis mission; mission dedicated to Department of Defense. 1985 November 26 STS-61-B 3 communications satellites deployed: MORELOS-B, AUSSAT-2 and SATCOM KU-2. 1988 December 2 STS-27 Mission dedicated to Department of Defense. 1989 May 4 STS-30 Deployed Magellan Probe. 1989 October 18 STS-34 Deployed Galileo probe. 1990 February 28 STS-36 Mission dedicated to Department of Defense. 1990 November 15 STS-38 Mission dedicated to Department of Defense. 1991 April 5 STS-37 Deployed Compton Gamma Ray Observatory. 1991 August 2 STS-43 Deployed TDRS-5. 1991 November 24 STS-44 Mission dedicated to Department of Defense. 1992 March 24 STS-45 Carried Atmospheric Laboratory for Applications and Science (ATLAS) mission 1. 1992 July 31 STS-46 Deployed ESA European Retrievable Carrier and NASA Tethered Satellite System. 1994 November 3 STS-66 Carried ATLAS mission 3. 1995 June 29 STS-71 First shuttle docking with Space station Mir. 1995 November 12 STS-74 Carried docking module to Mir. 1996 March 22 STS-76 Rendezvous with Mir, including crew transfer of Shannon Lucid. 1996 September 16 STS-79 Rendezvous with Mir, including crew transfer of Shannon Lucid and John Blaha. 1997 January 12 STS-81 Rendezvous with Mir, including crew transfer of John Blaha and Jerry Linenger. 1997 May 15 STS-84 Rendezvous with Mir, including crew transfer of Jerry Linenger and Michael Foale. 1997 September 25 STS-86 Rendezvous with Mir, including crew transfer of Michael Foale and David A. Wolf. 2000 May 19 STS-101 International Space Station assembly mission (re-supply ISS). 2000 September 8 STS-106 International Space Station assembly mission (re-supply ISS). 2001 February 7 STS-98 International Space Station assembly mission (carried and assembled the Destiny Laboratory Module). 2001 July 12 STS-104 International Space Station assembly mission (carried and assembled the Quest Joint Airlock). 2002 April 8 STS-110 International Space Station assembly mission (carried and assembled the S0 truss segment). 2002 October 7 STS-112 International Space Station assembly mission (carried and assembled the S1 truss segment). 2006 September 9 STS-115 International Space Station resupply and construction (P3 and P4 truss segments). NET 2007 June 8 STS-117 International Space Station resupply and construction (S3 and S4 truss segments). Space shuttle Atlantis in popular culture. The Space Shuttle orbiter Atlantis landing in 1997, at the end of STS-86. Atlantis on top of the Shuttle Carrier Aircraft in 1998. In the film Deep Impact the crew used the Space Shuttle Atlantis to get to the mission craft, Messiah. In the game The Dig, an unnamed shuttle participates in the mission of firing the asteroid. However in the game demo, the name "Atlantis" is mentioned. In the film Armageddon, the Space Shuttle Atlantis is destroyed in orbit at the beginning of the film by a meteor shower. In the episode of the animated show Recess which was called "Space Cadet," the class watches a space shuttle launch. The vehicle is Atlantis. In the movie SpaceCamp, the space shuttle Atlantis is featured. The children were onboard the shuttle during an engine test when one of the Space Shuttle Solid Rocket Boosters was ignited. In the free space simulator Orbiter created by Martin Schweiger, Atlantis is the default space shuttle you can pilot. In the PlayStation game "Treasures of the Deep," the player goes on a mission to destroy the shuttle's remains after it sinks in the Mariana Trench. 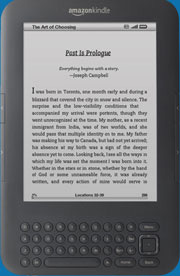 In the Tom Clancy novel Red Storm Rising Atlantis was pulled off the launch pad just before a scheduled mission to allow the military to switch out her original payload with additional reconnaissance satellites just before the outbreak of war with the Soviet Union. In a Bill Nye the Science Guy Episode "Space Exploration," Atlantis as well as Columbia make an appearance.